Hear ye, hear ye! This worksheet is guaranteed to help your child learn about his sense of hearing. Help him identify which items make sounds. Then let him draw to his heart's content! Explore your sense of sight with this fun worksheet. This colorful worksheet will get your child excited about the five senses and thinking about his sense of taste and drawing food he likes. This colorful worksheet is great to get your child thinking about the five senses, like the sense of touch as she draws and talks to you. This colorful worksheet is great to get your child thinking about the five senses, like the sense of touch as he draws and talks to you. There's still plenty more to see with this follow-up worksheet to 'Your Sense of Sight'. Here's a colorful worksheet for your child to explore one of the five senses, like her sense of taste, through drawing and visuals. This colour worksheet will get your child thinking about the five senses, like the sense of smell. He'll draw and explore while you talk together. 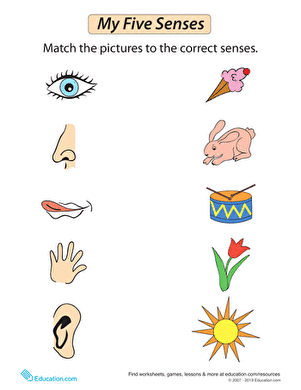 This colour worksheet is a visual way to get your child thinking about the five senses. She can draw and explore the idea of how things smell. Get your child thinking about the five senses with this matching worksheet that gets her to consider taste, touch, sight, smell and hearing.